Ultimate's heat-activated, multi-force archwires provide a gradual increase of loads from anterior to posterior regions. ßIII-CNA® Looped Arches, with preformed Mushroom loops are constructed of our nickel-free Beta Titanium alloy to provide consistent, gentle forces throughout treatment. ßIII-CNA® Looped Arches provide significant benefits over Stainless Steel looped archwires. Allows torque or root movement of incisors. Control of root position of posterior teeth. Pre-formed loops and consistent force reduce chair time. Archwire segments can be activated independently. 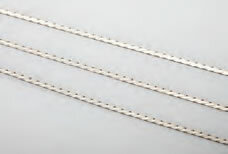 Proportionally-shaped loops for upper and lower archwires.